Age: I don't keep track of my own damn age O_O. Grimmjow appears to be a laid-back and irreverent individual at first glance, but this scruffy exterior hides a brutal, impulsive, excessively-violent personality and a lethally-short temper. Grimmjow is blunt, sarcastic, and quite sadistic, revealing a psychotic grin whenever he becomes excited, much like Kenpachi Zaraki or Hollow Ichigo. He displays little respect for authority and says whatever is on his mind, regardless of whether or not it is appropriate. This attitude leads to conflicts with Kaname Tōsen, who holds Grimmjow in the same low regard as he did with Kenpachi Zaraki. He also has conflicts with Ulquiorra Cifer, the 4th Espada, usually because Ulquiorra interrupts his battles or otherwise clashes with Grimmjow's ideals, and confidently believes Ulquiorra's powers to be weaker than his, a point he is eager to prove. He develops an additional grudge against Ichigo Kurosaki for wounding him during their first and second fights, and is eager to return the favor. He intentionally kept the large scar on his chest from their first battle as a reminder of this. Grimmjow is also infuriated by Ichigo's belief that he can defeat him regardless of how badly he is injured, which Grimmjow sees as Ichigo looking down on him. Weapon type: Bare f*cking hands...and Pantera (豹王 (パンテラ), Pantera; Spanish for "Panther", Japanese for "Panther King"). His Zanpakutō's tsuba resembles a rigid, crooked "S," while the sheath and handle are light blue. Expert Swordsmanship Specialist: Although he usually prefers hand-to-hand combat, Grimmjow is also able to fight effectively with his Zanpakutō as well. He is shown holding his own against Ichigo who at the time was using Bankai and Hollowfied, when he only had one arm. He then is shown holding his own against Shinji Hirako as Shinji wore his Hollow mask. In one-on-one battle against Ichigo, he is seen showing considerable skill in swordsmanship. Pesquisa: Grimmjow has demonstrated this ability when he and his Fracción invaded Karakura Town, during which he displayed he could detect targets from a considerable distance. 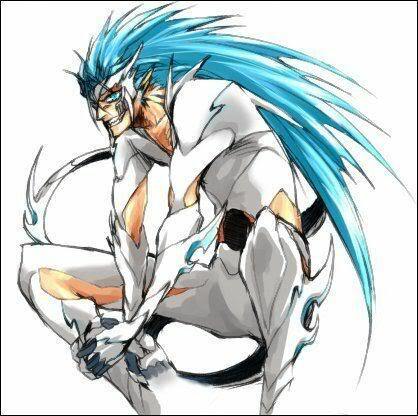 Hierro: As the Sexta Espada, Grimmjow has the passive ability known as Hierro. Grimmjow's Hierro is strong enough to effortlessly block the sharp edge of a released blade Shikai with his bare hand, later showing the density of his skin by being able to grab Ichigo's Bankai blade, blocking with his bare hand with no damage. He is able to survive a point blank range Getsuga Tenshō though emerging with grievous injuries, Grimmjow then withstands being frozen by Rukia's Shikai, noting that simply freezing the top layer of his skin isn't enough to kill him. Enhanced Strength: Grimmjow is shown using his strength to push back Ichigo with little effort. He is shown throwing Ichigo at a considerable distance using his own sword that he had grab a hold of during an attack. His kicks are strong enough to strike a opponent with enough force to have them sent flying with enough force to destroy several buildings in the surround area. He was also shown impaling Luppi, his Espada replacement, through the chest with relative ease despite the other's Hierro. Great Spiritual Power: His spirit energy is very high, noted by Rukia to be "worlds apart" from his Fracción and making her wonder if he was even the same species. Highly Perceptive Combatant: Grimmjow is able to discern from simple observation that upon his first fight with Ichigo that his Bankai enhanced Getsuga Tenshō was damaging to his body. He also notes that Ichigo is capable of at the most 2 to 3 more of those attacks at best. Upon his second fight with Ichigo, he makes note that Ichigo was straining to use his Hollowfication as his soon as his mask came off his breathing instantly became quicker, but he notes that it may not be so simple as that. Denoting that it must have something to do with him having took so much damage or because he's lost too much spiritual energy or maybe that it has a limit to the amount of time he can use it.Upon his third fight with Ichigo, he notes that he extended the amount of time he can stay in his masked state. Cero: Grimmjow is capable of firing a red Cero from the palm of his hand, as well as his fist. He has shown firing it at point-blank range to increase lethality as when he incinerates the top half of Luppi after regaining his arm and rank. He again uses it at point-blank range against Menoly, incinerating her. His Cero is powerful enough to neutralize the Cero of fellow Espada Ulquiorra Cifer during their brief scuffle, even though it badly burned his right arm from his hand to his elbow. Grimmjow has also shown the ability to fire one Cero from each hand. Added by Tinni■Gran Rey Cero: As an Espada, he is able to use this Espada-exclusive Cero variant, which produces a much larger and more powerful version of the normal Cero, enough potentially to cause great damage to Las Noches itself. For this reason, Aizen banned its use inside the fortress, although Grimmjow clearly ignored this during his last battle with Ichigo. In order to fire it, it seems Grimmjow must first cut his own hand on his Zanpakutō, mixing his blood with the Cero. Grimmjow's Gran Rey Cero is colored blue. Garganta: Garganta is how Arrancar move to and from Hueco Mundo. Grimmjow demonstrated this ability during his own personal invasion of Karakura Town. It literally tears open the dimensional fabric separating the worlds, revealing a tunnel of whirling, torrential energy that must be focused and solidified to create a discernible pathway. Sonído Master: As the 6th Espada, Grimmjow is very proficient in the use of Sonído. Even in his unreleased state, he is able to keep up with Ichigo Kurosaki while using Tensa Zangetsu. Initially, Grimmjow could even surprise and overwhelm Ichigo with his speed. Pantera (豹王 (パンテラ), Pantera; Spanish for "Panther", Japanese for "Panther King"). His Zanpakutō's tsuba resembles a rigid, crooked "S," while the sheath and handle are light blue. Grimmjow's Resurrección form, damaged during his battle with Ichigo. ■Enhanced Hierro: Grimmjow's Hierro receives an augmentation as well. He was hit by a point-blank Getsuga Tenshō from Ichigo Kurosaki in his Visored state and received no visible damage. ■Enhanced Speed & Agility: Complimenting his already impressive speed and power, Grimmjow's released state augments his speed drastically, giving him animalistic agility and movement to match, allowing him to keep up with the masked-enhanced Bankai of Ichigo. ■Enhanced Strength: His strikes pack enough power to incidentally destroy large skyscraper-sized pillars in Las Noches via collateral damage during the fight with Ichigo. His strength was also enough to send Ichigo through several buildings with one strike, as well as send him flying hundreds of feet with, merely with a few light punches and kicks. ■Shockwaves: When in his released form, he can roar loudly enough to create shockwaves in the air and surrounding area, powerful enough to throw off his opponents. Added by Gojita■Darts: He can also fire a large number of explosive "darts" from his elbows with enough charge to demolish huge buildings. They take the appearance of dark green crystalline unevenly cut stones. A Hollow Mask-enhanced Ichigo was somewhat able to withstand 5 of them, and continue fighting. Grimmjow performing Desgarrón, his most powerful technique. Added by Evangelion0189■Desgarrón (豹王の爪 (デスガロン), desugaron; Spanish for "Tear", Japanese for "Panther King's Claw"): His strongest attack; His claws glow and then he makes a slashing motion that creates giant "claws" of solidified energy from the end of each finger. The attacks act as a ranged claw attack, which he controls like his regular claw attacks, by using slashing motions. The power and force behind them is considerable and Ichigo was only able to deflect and shatter them through sheer force of will. Grimmjow is first introduced scolding Ulquiorra Cifer for not killing Ichigo Kurosaki, believing that he might become a threat in the future. After almost getting into a confrontation with Yammy, Ulquiorra tries to explain that Aizen is not looking at Ichigo in his current state but his rate of growth. He argues that his power while great is more than likely be what destroys him or cause him to become one of their pawns. Grimmjow doesn't believe in that reasoning and notes that he is just as likely to become more powerful and become a real threat. Ulquiorra mentions that if that were to happen he would simply end Ichigo's existence. Grimmjow later decides to rectify Ulquiorra's "mistake", and leads his Fracción to Karakura Town in an unauthorized mission. Upon using Pesquisa to determine that there are more spiritually powerful beings in the area then when Ulquiorra was there, Grimmjow tells his team to be careful and to kill anyone with even the slightest Spiritual Pressure. Grimmjow blocking Ichigo's Zanpakutō with his bare hands. Added by KylecharmedAfter Rukia Kuchiki comes to Ichigo Kurosaki's aid and kills Grimmjow's Fraccion Di Roy Rinker they are both confronted by Grimmjow who introduces himself as the 6th Arrancar. Grimmjow approaches them and asks who is strongest. Rukia yells to Ichigo to get back, but before she can react Grimmjow is upon her and impales his hand right into her stomach, noting that she is not the strongest. An enraged Ichigo quickly moves to attack Grimmjow. As Ichigo attacks him Grimmjow effortlessly blocks the blade with his hand, pushing Ichigo away. Grimmjow decides to toy with Ichigo goading him to release his Bankai and attack him. After threatening to do to Ichigo what he did to Rukia an angered Ichigo quickly complies to the request and releases. Once again Ichigo moves to attack but Grimmjow easily steps out of the way of the attack and grabs Ichigo's sword with his bare hand and uses it as leverage to throw Ichigo blocks away from him. Grimmjow moves to attack Ichigo who uses his enhanced speed to appear behind him, much to the Espada's surprise. He easily counters Ichigo's attack blocking it with his forearm and follows up with multiple kicks to Ichigo's head, sending him crashing into the buildings below. Grimmjow states he is unimpressed with Ichigo's Bankai, noting that it only enhances his speed. As the smoke clears Ichigo revels that he has recovered and unleashes his Getsuga Tenshō, Grimmjow blocks it but it still lands a direct hit greatly scarring his torso. Rather than being enraged Grimmjow is surprised and delighted at the technique. Grimmjow laughs noting that this turn of events is great seeing as now he finds Ichigo worth killing. Grimmjow takes out his Zanpakutō and states that Ichigo shouldn't just stand there as now its his turn. But before Grimmjow can act he is stopped by the arrival of Kaname Tōsen, who tells him to sheath his sword. Grimmjow becomes enraged that Tōsen is there prompting an explanation. Tōsen tells him that he has attacked the Human World, mobilizing five Arrancar without permission and leading them to their deaths as well as the fact that it was all against orders. He tells him that Aizen is furious and that his punishment will be decided in Hueco Mundo. Tōsen opens a Garganta and the two leave much to Grimmjow's unwillingness. When Ichigo demands him to come back as their fight isn't over yet, Grimmjow states that he is a fool, as the only reason he still lives is because the fight isn't over. He then notes how Ichigo's Getsuga Tenshō is damaging his own body and that its use is limited. Even if he could continuously use the technique its still not powerful enough to defeat his released state. He then tells Ichigo to remember his name and to pray that he never hears it again, for if he does, it will be that last thing he hears. Grimmjow with his arm cut off by Kaname Tōsen. Added by GojitaWhen Aizen refuses to punish Grimmjow, Tōsen askes that he be allowed to execute him. Grimmjow notes that he must have a personal problem with him which causes Tōsen to explain that he serves justice and doesn't tolerate those who sow discord. He then suddenly severs and incinerates Grimmjow's left arm. Enraged Grimmjow moves to attack him but is quickly told to stop by Aizen, who reminds him that if he were to attack Tōsen he would have no reason to pardon him. Realizing his situation Grimmjow reluctantly leaves. A month later, Grimmjow is present at the creation of Wonderweiss Margela. Shortly after Aizen personally sends Grimmjow on the next invasion, along with Yammy Llargo, Wonderweiss, and his replacement, Luppi Antenor. Upon arrival Grimmjow notes that Ichigo isn't present in the group of Shinigami they encounter and leaves to track him down. Grimmjow and Ichigo encounter each other with Ichigo promising to show him how much has changed in the past month. Ichigo activates his Bankai. Grimmjow reminds him that his Bankai serves no purpose as he was completely helpless against him last time. In turn Ichigo reminds him that it was his Bankai technique is what gave him that scar across his torso. He then asks him what happened to his arm, to which Grimmjow states that he threw it away because he doesn't need two arms to kill him. Ichigo promises not to hold back and reveals his Hollowfication, greatly surprising Grimmjow. He moves fast to attack but Grimmjow unsheathes his Zanpakutō fast enough to counter the attack. Ichigo then releases his Getsuga Tenshō at point blank range. Grimmjow survives the attack but sustains grievous injuries and notes that the power Ichigo is using is not that of a Shinigami and asks him what has he been doing this past month. In response Ichigo fires another Getsuga Tenshō so fast that Grimmjow can't do anything but attempt to block it. Before Grimmjow realizes Ichigo appears behind him and fires another Getsuga Tenshō, causing Grimmjow to be hit from two sides sending him falling out the sky. Ichigo moves to go after him but Grimmjow recovers and fires a Cero, which Ichigo blocks only for Grimmjow to appear behind him. He tries to attack but Ichigo senses him and counters his attack. In that instant Ichigo's mask breaks and Grimmjow quickly takes the upper hand and bats Ichigo away. Grimmjow's battle is stopped by Ulquiorra. Added by Lia SchifferAs Ichigo falls Grimmjow slashes him across his chest. As he continues his assault he notes to Ichigo that he seemed to lose power and began to strain to use his power, he states that he has taken his share of damage but the battle is now over as in the end Ichigo's power wasn't enough to defeat him. As their fight moves down to the street level Grimmjow keeps up the assault. When Ichigo attempts to summon his mask it fails, Grimmjow simply kicks him sending him flying blocks away. Grimmjow remarks what he has observed about Ichigo's mask but states that in any case he won't be using it again as he uses his Zanpakutō and stabs Ichigo in his arm pinning his sword hand to the ground. He then charges a Cero intent on incinerating Ichigo's head entirely, but before he can fire it his arm is encased in ice. Rukia shows up to save Ichigo, she then releases her Hakuren technique freezing Grimmjow in ice. As she tries to free Ichigo her ice is quickly broken and Grimmjow grabs her by the head and charges his Cero, as he scolds her for underestimating him enough to think that she could freeze him to death. Ichigo tries to stop Grimmjow but his arm is pinned to the ground. Shinji Hirako arrives and saves Rukia. He makes note that he hates getting involved in Shinigami fights, but concedes that when one hears the sound of fighting so close by one just can't ignore it. When Grimmjow asks him who he is Shinji tells him it doesn't matter and Grimmjow proceeds to attack him. Having a small discussion with Grimmjow, he is then suddenly attacked by the Espada, who declares his intentions of killing him. Dodging all of the attacks, Shinji realizes how violent Grimmjow is and the fight is destroying everything around them. Thus, Shinji dons his Hollow mask much to Grimmjow's shock as Shinji engages the Espada. Shinji tells Grimmjow that he is sorry but he seems strong so he can't take it easy on him, as he prepares to fire a Cero at the Espada. The blast sends Grimmjow hurtling to the city below. Shinji then tells him that he knows the Espada minimized the damage of the Cero by hitting it with his own. An enraged Grimmjow pulls out his Zanpakutō and begins to release, but Ulquiorra Cifer comes and retrieves Grimmjow before he can do so. Orihime Inoue restores Grimmjow's arm to demonstrate her powers. Added by SantaTeresaOnce back in Las Noches, Aizen has Orihime Inoue restore Grimmjow's arm as a demonstration of her power. Grimmjow has her bring back his Espada tattoo, as well, and impales Luppi Antenor through the chest with his arm in order to regain his rank once she finishes. He then incinerates Luppi's entire upper body at point blank range. Later, he attends a meeting called by Aizen, who tells the Espada that they are being invaded by Ichigo Kurosaki, Uryū Ishida, and Yasutora Sado. Grimmjow tries to leave but is stopped by Aizen who uses his Reiatsu to force Grimmjow onto the floor. Aizen then orders the Espada to wait for the intruders. After learning about Ichigo's defeat by Ulquiorra, Grimmjow breaks into Orihime's room while Loly and Menoly are attacking her. Grimmjow easily beats and knocks out Loly and then kills Menoly with a point-blank Cero, then rips off Loly's leg. Grimmjow reveals that he saved Orihime because of her giving him back his arm. He then demands she help him run an errand. Once they both arrive where Ichigo was defeated, he tells Orihime to heal him. She succeeds in reviving him but Grimmjow insists she heal him fully as he wants to settle their score against each other. Orihime complains but Grimmjow scolds her and tells her to do what she's told, however Ulquiorra appears behind interrupting them. Added by Arrancar109Ulquiorra questions Grimmjow's reason for being there, and starts walking towards him demanding an answer. Grimmjow smirks, not saying anything. Ulquiorra then asks Grimmjow to hand Orihime over, stating that she is to be in his care. Grimmjow, refusing to hand her over, quickly attacks Ulquiorra, saying how Ulquiorra is afraid to fight him because he thinks Grimmjow would crush him. Using a Cero, Grimmjow blasts Ulquiorra in the air but he deflects the attack. Then, Ulquiorra uses Sonído to appear above Grimmjow and fire his own Cero. Grimmjow blocks it, and the tower explodes. Grimmjow then uses Caja Negación to seal away Ulquiorra. He then demands Orihime to continue healing Ichigo, to which she refuses as she knows he just wishes to hurt him. Ichigo gets up and tells him to let her go as he asks Orihime to continue to heal him and then Grimmjow who had taken damage from Ulquiorra's Cero. As Ichigo wanted them to be able to fight on equal ground. Added by TinniGimmjow and Ichigo face off against each other. Grimmjow goes to fire a Cero but Ichigo blocks it with his sword and proceeds to use his Getsuga Tenshō but before he can release it Grimmjow throws his Zanpakutō and uses his other hand to fire a Cero which destroys a nearby structure but the two blasts cancel each other out and the two are left unharmed. Then Grimmjow vows to kill Ichigo. Grimmjow retrieves his Zanpakutō and attacks Ichigo as they go toe-to-toe he asks Ichigo what is the true reason he came to Hueco Mundo, noting that if he really came to save Orihime he would have left with her as soon as he saw her. He then explains that the real reason is that he wanted to fight, as at his core he is a Shinigami fighting a Hollow. Grimmjow states its a natural instinct to fight just as it has been for thousands of years. They continue to battle and Grimmjow fires a Cero to which Ichigo counters with a Getsuga Tenshō. His Cero overtakes Ichigo's technique but Ichigo side steps the attack before he is hit. Grimmjow appears behind Ichigo using Sonído, but Ichigo detects him and counters his attack but he still gets cut. Grimmjow lands and places his Zanpakutō in the ground, he then cuts his hand and fires a Gran Rey Cero at Orihime and Nel Tu. Ichigo seeing this dons his Hollow mask and moves in time to block the blast. In response Grimmjow releases his Resurrección, to which he then screams which lets out a Shockwave and then launches himself at Ichigo. He sends Ichigo flying, crashing into multiple structures. He quickly moves and attacks Ichigo with vicious kicks and hitting Ichigo sending him crashing into a large structure below. Ichigo instantly appears behind Grimmjow and uses his Getsuga Tenshō, Grimmjow only starts to laugh maniacally and tells Ichigo how much he hates his "eyes". Ichigo with his Hollow mask fighting Grimmjow in his released state. Added by SantaTeresaGrimmjow goes to strike Ichigo's mask but he grabs his hand and then slashes him with a Getsuga Tenshō enhanced attack slashing Grimmjow across his chest. He then goes on the offensive but Grimmjow counters and their fight continues with great ferocity. Grimmjow fires darts out of his elbow but Ichigo dodges them and then jumps in front of them to protect Orihime from them, he then goes back to face Grimmjow. Ichigo slashes Grimmjow again across the torso and as the Espada falls to his knees he grabs Ichigo's blade with his hands and notes that Ichigo actually thinks he can defeat him. Grimmjow impales him in the stomach with his hand he then proceeds to beat Ichigo relentlessly as he berates him from thinking he was more powerful than him. He then vows to smash Ichigo to pieces as he uses his most powerful technique, Desgarrón. Grimmjow is attacked and incapacitated by Nnoitra. blocks the technique but is forced back; he eventually regains his footing and cuts Grimmjow's technique causing it to shatter to pieces. Ichigo states that he is not the only one who wants to win as he moves to attack him. He cuts through another Desgarrón as he proclaims he will defeat Grimmjow and everyone in his way and leave with his friends. He gets in close and slashes Grimmjow across his torso. You will need to take a test for the bio,stein. Though are you planning on going for the sexta espada position aswell? Alright then,I will create the thread soon. I shall do your test for now,unless i get busy. If so,ingwer/chir will replace me.